In this article, we’re going to be discussing the 10 best guitar loop pedals that you can purchase in 2019. As always at Sustain Punch, we will firstly explain the function of a loop pedal, also known as a repeater pedal, and why you may want one to place on your guitar effects pedalboard. What are Guitar Loop Pedals? How does a Guitar Loop Pedal actually work? Conclusion: What Guitar Loop Pedal do we recommend? Guitar Loop Pedals are simply guitar effects processors that work to loop, or repeat, the input signal provided. In other words, it plays the same musical signal over and over again, until specified not to. You may be asking, well how does it know what part you wish to loop, or how long you want to loop it for? And to answer these two questions, all of these controls are provided on the front of the pedal, on the user interface. A guitar looper pedal will normally have a clear user interface in which the guitarist has access to a footswitch (to engage and disengage the looping effect), and looper timing and even frequency adjustment knobs. In turn, this allows a guitarist to active the looper effect in real-time and control all of the timing parameters surrounding its operation. Ok, so that’s a little bit about the processor itself. Let’s talk more about specific looper pedals that you may be interested in. Due to the fact that all of the pedals in this list vary quite significantly in price, we’ve ordered them based on this, although you can see editor’s recommendations in the list below, and the conclusion, so if price is not a determining factor and you’re looking for a specific feature, you’ll find it highlighted here. The Rowin Tiny Looper pedal has received an average rating of 3.5* out of 5 stars from over 65 Amazon customer reviews – Read these reviews here. 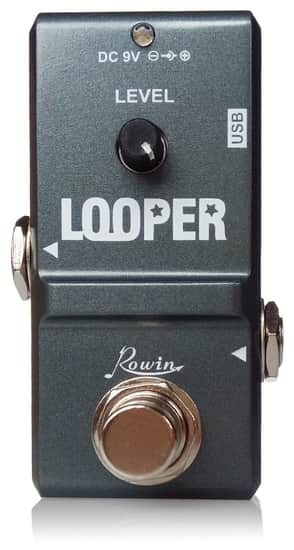 The Rowin Tiny Looper pedal is the cheapest processor on our list, and we’ve included it not only for this reason, because we simply like to accommodate for every reader and the unique budget that they have… but also because it has some good aspects and provides great value for money, from a pedal that costs less than $50. Before we go into depth about the pedal’s key features, let’s first talk a little bit more about Rowin. The brand itself has been around for several years and mainly creates very affordable music equipment… Their music equipment is often very basic, but does the job! Ok, so let’s talk more about their ‘Tiny Looper Pedal’… Well as the name suggests, it’s certainly small in size, and therefore would be suitable for the guitarist with a minimal amount of space on their pedalboard. The pedal is capable of providing up to 10 minutes of loop recording time, and it can be operated by simply setting the level knob to a suitable output, and engaging the footswitch… Simple! Surprisingly, this device also has USB integration, so that you can import/export loop samples, for further editing and refinement in your DAW (Digital Audio Workstation). Although Rowin does not go into detail as to how this can be done, we imagine the process is fairly simple. We were also very impressed by the technical specifications of this unit’s recording capability, using 24-bit conversion at a sample rate of 48kHz. Hmm, well we would have personally liked to see the unit provide more looping parameter controls & effects. However, considering the price-tag we really don’t expect that to happen, as it would directly affect the price! And this unit’s price is it’s USP. 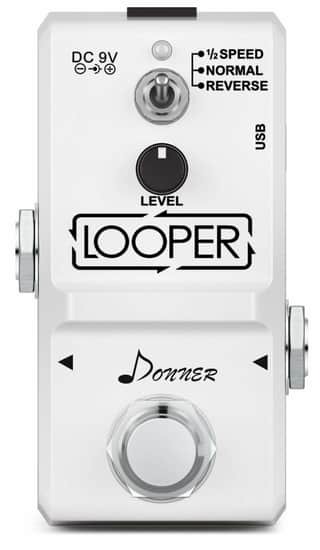 This looper/repeater pedal is suitable for any guitarist who requires an ultra-low-cost pedal, which is small, light, simple to use, doesn’t provide a lot of additional looping features but also have USB integration. For anyone else who has a large budget of say $100, we would advise that you choose the Nux Loop Core instead, which we’ve reviewed below. Otherwise, look at the Donner pedals below, which feature some additional looping functions, and are priced around $50. The Rowin Tiny Looper pedal has received an average rating of 3.5* out of 5 stars from over 150 Amazon customer reviews – Read these reviews here. The Rowin Tiny Looper unit has three modes, this includes Half Speed Mode, Normal Speed Mode and Reverse Mode. All of this functionality is rather impressive considering that this unit is only $45 … *Take a look at the video demonstration below to see these modes in action. Surprisingly, this device also has USB integration, so that you can import/export loop samples, for further editing and refinement in your DAW (Digital Audio Workstation). And yes, this USB import/export feature can be used on both Mac and PC. Hmm, there really isn’t much that we would consider improving, as it would directly affect the price! And this unit’s price is it’s USP. For anyone else who has a large budget of say $100, we would advise that you choose the Nux Loop Core instead, which we’ve reviewed below. The Electro-Harmonix 720 has received an average rating of 4.0* out of 5 stars from over 53 Amazon customer reviews – Read these reviews here. The Electro-Harmonix 360 Nano is the ‘younger brother’ in this series to the ‘Electro-Harmonix 720’ pedal. The 360 Nano is more compact in size and has some fantastic features. Firstly, for those who aren’t aware of who Electro-Harmonix are. Let’s firstly talk about the brand, who they are and how the two loop pedals within this series really differ. Ok, so Electro-Harmonix is an extremely large audio equipment manufacturer based in the USA. They were founded in 1968 and have specialized in becoming experts in the field of guitar effects pedals. Therefore, if you get the chance to play one, you’ll notice that all of the aspects from it’s sound to operation ‘just work!’… Simply a result of over 50-years worth of improvement and progression. Now, let’s talk more about the Electro-Harmonix 360. The 360 Nano is an extremely compact looper processor, which is housed in a die-cast metal chassis. It provides up to 6 minutes of loop recording time and has 11 loop types that can easily be referred to from a single knob that is located on the front of the interface. Where the Electro-Harmonix lacks is simply in the difference between ‘it’ and it’s older brother, the 720 version. Therefore we know that improving specifications on the 360 Nano would merely compete with the 720, and wouldn’t be even worthwhile considering. 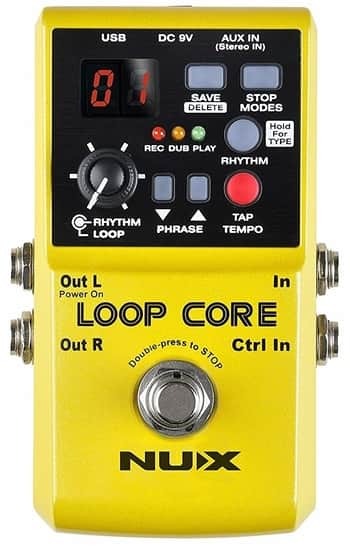 However, for the price of around $100, we prefer the Nux Loopcore (reviewed below), as it provides more personalization options including PC/Mac connectivity for the purpose to import/export loops to a DAW for further refinement. It has many more features that you’ll probably want to check out! Whilst we are big fans of the brand Electro-Harmonix, and as you can see from the video demonstration, they provide high quality sounding equipment, we simply cannot recommend it… As we prefer the Nux Loopcore. The Nux Loop Core Pedal has received an average rating of 3.9* out of 5 stars from over 72 Amazon customer reviews – Read these reviews here. 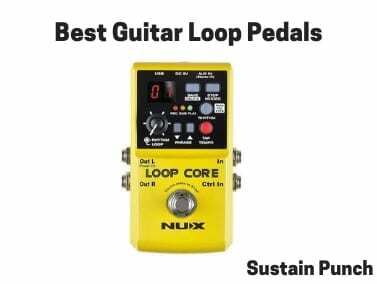 The Nux Loop Core Pedal is Nux’s original flagship guitar looper and has received a wide range of positive reviews considering the clear effort and time put into the pedal’s development. Let’s firstly talk about the company Nux before we dive into more about the specific Loop Core Pedal. Nux has been developing all kinds of recording equipment, including guitar effects, amplifiers and audio interfaces since 2005. Their main goal has been to provide musicians with high-quality audio equipment at an affordable cost. Ok, now let’s talk more about the Loop Core Series Pedal. The pedal itself is priced at $99, and believe us when we say, for $99, you won’t get much more in a compact pedal than this! Some of the product highlights for us include the 6-hour recording time maximum capacity, 99-savable, editable, importable and exportable preset banks, the USB integration in order to connect to your MAC/PC, automated tempo detection, loop tempo change without changing the pitch/key, alongside the 40+ different accompaniment drum rhythms that you can choose from… Wow! That was a lot to go through! And we’ve not even talked about the cabinet simulation and frequency compensation settings. Essentially, these settings allow for your accompaniment to not drown out the sound of your loops. Additionally, the pedal allows you to create as many loop layers as possible.. So your audience will be left in utter amazement. Also, the main functioning of the pedal is rather simple, with it either starting when you click the foot-switch (manual mode) or when you play the guitar (auto-start mode). Nux have been so methodical in this pedal’s development that they have also included different ‘stop’ modes. With a double-tap stopping the loop immediately, whilst in ‘finish-mode’ the pedal will play to the end of the current phrase, and finally in ‘fade-out mode’… Well, you can guess right? It begins a 10-second fade out. Ok, so for the price of $99 you’re simply getting a high-quality, 16-bit, compact looping unit that has a mind-blowing number of looping functions and settings. In our opinion, there is simply nothing you can improve with regards to the pedal without it directly affecting the price. The Nux Loop Core pedal is definitely for the guitarist who doesn’t want to spend more than around $100, but needs a highly compact unit that is well-built, features a whole bunch of looping functions and will stand the test of time, whether or not you are just recording in-studio or in turn playing live shows. It even has a stereo aux input, for those who require this. The TC Electronic Ditto Looper has received an average rating of 4.5* out of 5 stars from over 108 Amazon customer reviews – Read these reviews here. 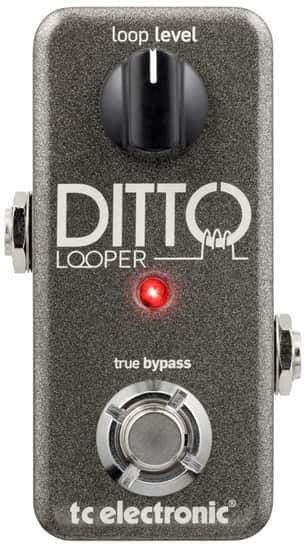 The Ditto Looper is a looper pedal built by the incredibly brand, TC Electronics. For those that don’t know much about TC Electronics, they’ve been around since the early days! Yes, we’re talking about the very early 1970’s. They’ve been active in designing and building all kinds of music equipment, including guitar effects, vocal effects pedals, audio interfaces and home recording studio equipment. This has given them a tremendous amount of experience in creating high-quality audio equipment at an affordable cost for the likes of you and me. Ok, so that’s a little about the company itself. Let’s talk more about the Ditto Looper pedal itself. Well, the Ditto Guitar Loop Pedal is undoubtedly one of the more simpler pedals to operate from this extensive list of the best guitar loopers. However, with that being said, don’t mistake its simplicity for a limit of the sound quality… After all, this device supports 24-bit sample rate audio… Meaning that it provides high-quality audio looping. However, for us personally, we would like to see more parameter controls, to adjust looping frequency and other things such as timing controls. As we just pointed out, this pedal lacks the functionality to really personalize your looping sound when comparing it to other pedals around the same $100 price-point, that we’ve featured in our list. 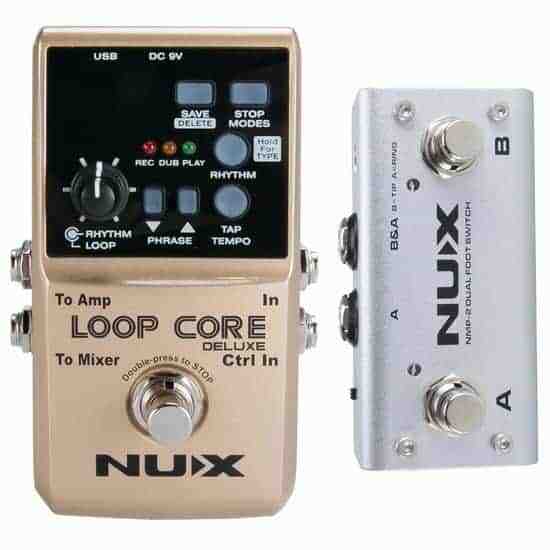 An example of one of these pedals that allows for further refinement of your sound is the Nux Loop Core guitar processor, which also provides rhythm accompaniment, 99 user programmable memory patches and even MAC/PC integration via USB connectivity… All in all, we would prefer the Nux Loop Core pedal over the TC Electronics Ditto Looper. Ok, so although we think there is a better option, as mentioned above. The TC Electronics Ditto Looper pedal is ideal for the guitarist who wants an incredibly easy-to-use looper processing unit, that just so happens to be very compact with a sturdy build. Multiple Editions of this product series, being a result of lots of improvements. The Boss RC-1 Guitar Loop Station has received an average rating of 4.5* out of 5 stars from over 126 Amazon customer reviews – Read these reviews here. The RC-3 is a Guitar Looper Pedal created by none other than Boss. For those who aren’t too familiar with Boss (Not many of you I can imagine), the company started in the early 1970’s and quickly became synonymously linked to the term guitar effects pedals. Over the following decades, they have refined all of the products in their different usage series, with their hands in a number of pies, including guitar tuner pedals, guitar synth pedals and many more. Because of Boss’s sheer wealth of experience, and the fact that their products have truly stood the test of time, you can be 100% sure that customer/user satisfaction is not an issue. After all, in most cases, they’ve had 30+ years of improvements for each product series, so you can imagine there’s not much left to improve. As for the Boss RC-1, it’s one of the more basic RC models within the series, only requiring the footswitch and output level to operate the looper function. The unit itself provides both monophonic and optional stereo input/output, which means that it’s suitable for guitarists who want that optional stereo functionality, which is fantastic value for money, considering it is priced at $99. Oh and we almost forgot! It comes with an incredible 5-Year Product Manufacturers Warranty. The Boss RC-1 is a very simple to use guitar looping processor. Where it lacks against it’s two older brothers (RC-3 & RC-30) is in looping time, multi-track looping, onboard programmable memory patches, USB integration with WAV editing and additional connectivity features, such as AUX and XLR input. However, if these features are not so important to you, this is certainly a looper pedal that cannot be easily improved, as, alongside the product features, it also comes with fantastic build-quality and that 5-year manufacturer’s warranty… Not to mention a string of positive customer reviews. 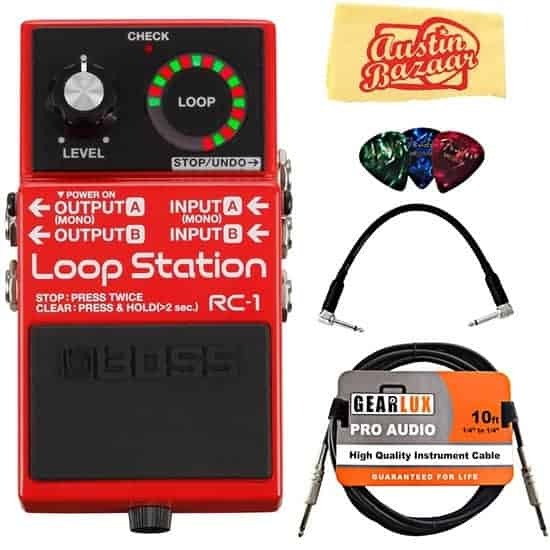 The Boss RC-1 is for the guitarist who wants a solidly designed looping processor, built by one of the most well-known, trustworthy guitar effects pedal brands in the world. This is definitely for someone looking at a more mid-range priced unit, that simply provides looping without all the bells and whistles. The Nux Loop Core Deluxe Pedal has received an average rating of 4.4* out of 5 stars from over 4 Amazon customer reviews – Read these reviews here. The Nux Loop Core Pedal Deluxe is Nux’s Premium-Model guitar looper and has received a wide range of positive reviews considering the clear effort and time put into the pedal’s development. Let’s firstly talk about the company Nux before we dive into more about the specific Loop Core Pedal Deluxe. Additionally, the pedal allows you to create as many loop layers as possible.. So your audience will be left in utter amazement. Also, the main functioning of the pedal is rather simple, with it either starting when you click the footswitch (manual mode) or when you play the guitar (auto-start mode). Nux have been so methodical in this pedal’s development that they have also included different ‘stop’ modes. With a double-tap stopping the loop immediately, whilst in ‘finish-mode’ the pedal will play to the end of the current phrase, and finally in ‘fade-out mode’… Well you can guess right? It begins a 10-second fade out. Ok, so for the price of $149 you’re simply getting a high-quality, 24-bit, compact looping unit that has a mind-blowing number of looping functions and settings. In our opinion, there is simply nothing you can improve with regards to the pedal without it directly affecting the price. The Electro-Harmonix 720 has received an average rating of 4.3* out of 5 stars from over 42 Amazon customer reviews – Read these reviews here. 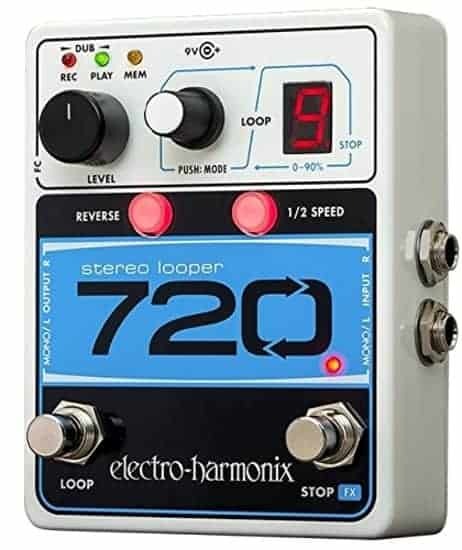 The Electro-Harmonix 720 is the ‘older brother’ in this series, with the ‘Electro-Harmonix 360 Nano’ being the more compact, slightly cheaper version. 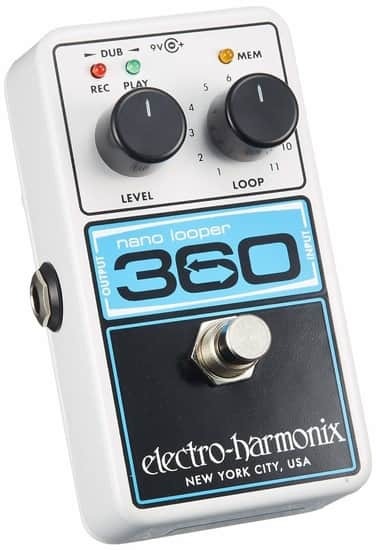 However, for those who haven’t read the ‘Electro-Harmonix 360 Nano’ review, and potentially aren’t aware of who Electro-Harmonix are. Let’s firstly talk about the brand, who they are and how the two loop pedals within this series really differ. The 360 Nano is an extremely compact looper processor, which is housed in a die-cast metal chassis. It provides up to 12 minutes of loop recording time (6 minutes more than the Nano 360 version) and has 10 loop types that can easily be referred to from a single knob that is located on the front of the interface. The amount of loop customization is simply limited when compared to other pedals within the same price range, such as the Nux Loopcore Delux. The Nux Loopcore Delux provides more personalization options including PC/Mac connectivity for the purpose to import/export loops to a DAW for further refinement. It has many more features that you’ll probably want to check out! Whilst we are big fans of the brand Electro-Harmonix, and as you can see from the video demonstration, they provide high quality sounding equipment, we simply cannot recommend it… As we prefer the Nux Loopcore Deluxe. 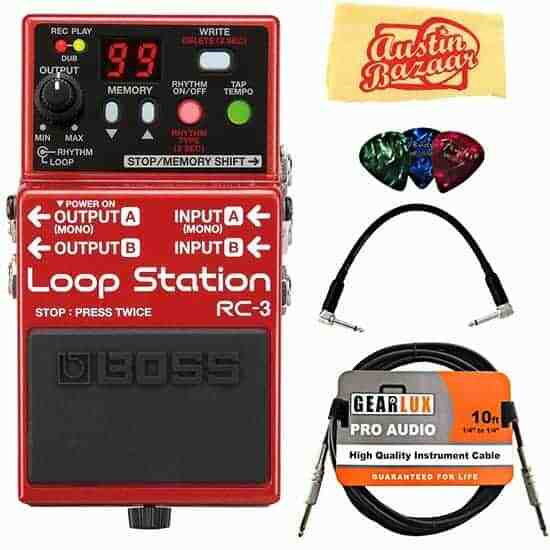 The Boss RC-3 Guitar Loop Station has received an average rating of 4.5* out of 5 stars from over 126 Amazon customer reviews – Read these reviews here. As for the Boss RC-3, this is the second most expensive looper unit that we’ve featured within our list, but not nearly as expensive as it’s older brother, the Boss RC-30. The main difference between the Boss RC-3 and RC-30 is that the RC-30 has multi-track looping capabilities, an XLR input and has 2 physical foot pedals, compared to the RC-1 having 1. Other than that, The RC-3 simply has everything! With up to 3-hours worth of looping time, 99 programmable looping presets, Stereo input/output, USB import/export capability and not to mention the rhymical accompaniment facilities, there isn’t much else that you could need from a guitar looper. An advantage of the RC-3 unit over other cheaper guitar looper units is that it can be powered through either battery or using a 9v power supply. According to Boss’s website, the unit can remain functioning for approximately 7.5 hours using Alkaline Batteries and 1.5 hours using Carbon-Zinc Batteries. The Boss RC-3 is a fantastic looping processor, and we honestly cannot see any downsides to the unit itself. Yes, it’s a little pricey, but you’re paying for the 40+ years of experience that Boss have, and all of the fantastic looping features in this processor! Not to mention the 5-year manufacturer’s warranty again! The Boss RC-3 is for the guitarist who wants a premium-quality looper pedal, made by a company known for the reliability of their products. It’s for the professional musician who wants all of the features of the RC-30, without the steep price, and excluding the XLR input, two footswitches and multi-track looping. Definitely, a pedal to consider! 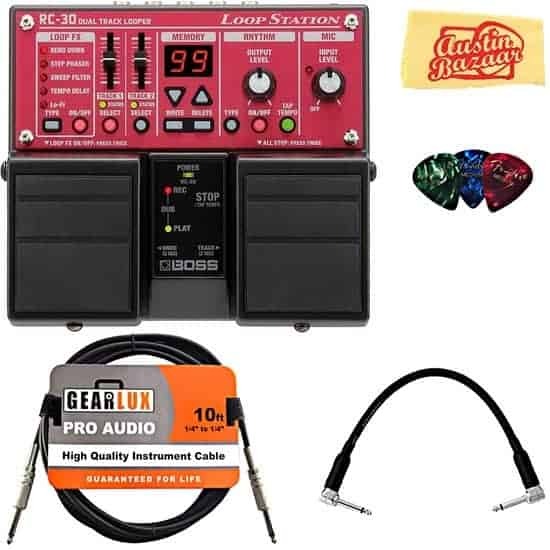 The Boss RC-30 Guitar Loop Station has received an average rating of 4.5* out of 5 stars from over 126 Amazon customer reviews – Read these reviews here. The RC-30 is a Guitar Looper Pedal created by none other than Boss. For those who aren’t too familiar with Boss (Not many of you I can imagine), the company started in the early 1970’s and quickly became synonymously linked to the term guitar effects pedals. Over the following decades, they have refined all of the products in their different usage series, with their hands in a number of pies, including guitar tuner pedals, guitar synth pedals and many more. As for the Boss RC-30, this is the most expensive looper unit that we’ve featured within our list, and that’s simply because it’s got awesome feedback, and we like to accommodate for every reader’s budget. The RC-30 simply has everything! With up to 3-hours worth of looping time, 99 programmable looping presets, Stereo input/output, USB import/export capability and not to mention the rhymical accompaniment facilities, there isn’t much else that you could need from a guitar looper. An advantage of the RC-30 unit over other cheaper guitar looper units is that it can be powered through either battery or using a 9v power supply. According to Boss’s website, the unit can remain functioning for approximately 7.5 hours using Alkaline Batteries and 1.5 hours using Carbon-Zinc Batteries. We are large fans of Boss, and when considering all of the factors such as the price, functionality and warranty, we don’t honestly think there is much that can be improved. Some may say that the unit is simply a little large, or a little ‘clunky’, and although that may be true, for the sheer number of features you’re getting, and to ensure that the internal circuitry is protected, I’d prefer to have the additional size and ‘clunkiness’. The Boss RC-30 is the ultimate looper toolkit, and therefore it’s for the guitarist who wants to have a reliable unit that provides a vast amount of looping functions, that can be programmed, edited and customized for your own style. We imagine this kind of processor would attract a gigging/touring musician who relies on looping in his/her set, and therefore wants to buy a high-quality piece of equipment, regardless of the premium price. As always with our recommendations, we like to accommodate for all of our readers. And therefore we’ve made the following recommendations based on multiple factors that we think will be important to our readers, such as price, functionality, size, etc. However, if you have time, please take a look at the specific pedal reviews, as we’ve featured video demonstrations, showing how the looper actually operates and sounds. Let’s get to it then! We hope that you find it useful!